The Givaty excavation site. Credit: Pierre Klochendler/IPS. The City of David archaeological site lies in the heart of the Palestinian district of Silwan, at the foot of the walled Old City. Adjacent to it lies the Givaty excavation site. Year-round for the past five years, the former parking lot has been giving way to the largest, most ambitious, Israeli archaeological project ever undertaken not just in Jerusalem, but in the whole country. And, the complex is most controversial. Notwithstanding the professional critique that, here in situ, the Bible is still considered the legitimate archaeological guidebook par excellence, Palestinians insist that the purpose of revealing biblical Jerusalem is to buttress the Jewish bond to modern-day Jerusalem. “Visitors come to the City of David not even realising that we live here,” protests Ahmad Qaraein, who lives in a three-floor building with a panoramic view over the Givaty site. His family has lived here for generations. Qaraein volunteers as counsellor at the provisional “We Love Silwan” summer camp, another parking lot located just a few metres down the street. Like many Palestinians, he believes Israel digs here less out of archaeological interest; rather, he claims, the ulterior motive can be found in Israel’s biblical claim over east Jerusalem. “Not only King David lived here. They scrapped a 1,200-year-old Islamic cemetery found on the upper floor,” he says. Ben-Ami oversees the Givaty digs. “Here, Jerusalem started; here, you see the latest period – the Muslim periods – through the Byzantine, Roman, Second and First Temple periods.” Ben-Ami shows an assortment of structures, mosaics, columns, walls above walls, layers upon layers. And, politics enter the fray. There’s one thing Israelis and Palestinians agree on – the battle for sovereignty over Jerusalem is the bedrock of their conflict. Palestinians want east Jerusalem as the capital of their future state. “This house stays in Palestine,” reads graffiti adorned with the national colours near the Givaty site. “Silwan is our village – Jerusalem our land, our history,” stresses Qaraein. Palestinians object to the dearth of building permits issued by City Hall and, as a result, the many houses already demolished. “Stones are more important than the living,” Qaraein notes sadly, adding that the digs undermine the structure of many buildings. Three years ago, a school partially collapsed, injuring 17 pupils. 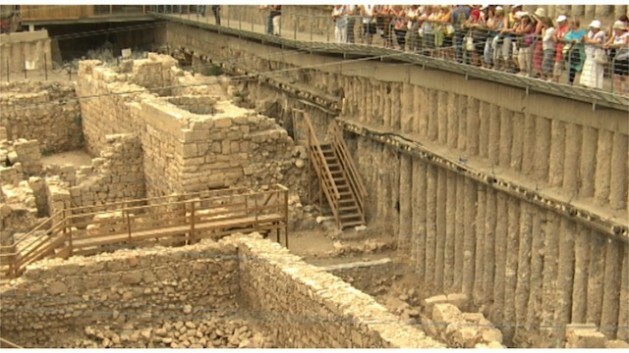 Residents blamed the incident on the archaeological tunnels running through Silwan. The Givaty excavation is a hive of activity. Students and volunteers dig and dust, making chains of buckets to evacuate soil, sorting pottery shards and ancient artefacts, exposing the long chain of conquests and re-conquests, of holy wars and crusades. In the last 2,000 years only, Jerusalem was captured 13 times. The site is administered by Elad, an Israeli right-wing association devoted to funding Jewish excavations as well as settlement buildings in the neighbourhood and across east Jerusalem. Were archaeologists to find an inscription, reading ‘Welcome to King David’s Palace’, would that grant Israelis the right to claim east Jerusalem is theirs, he contends. “Archaeology reveals civilisations and changes of civilisations. How can this site belong exclusively to one nation? Between past and present, what is more important – layers from 8th century BCE, or today’s peoples? Jerusalem’s not only Jewish. On the other hand, Jerusalem can’t be denied it never was Jewish.” That is the dilemma. Caught between archaeology and politics, between past and present, patiently waiting for the future to bury the present, Israelis and Palestinians know, the ancient battles for Jerusalem are very much alike today, and very much alive. Jerusalem was NEVER an Arab capital, and in modern times has been majority Jewish since the 1850s, or for over 150 years! A city does not have to be a capital some past history to be made one for a modern nation state, imagine how Washington D.C. was for centuries, a swampy area with indigenous people nearby. And of course Jerusalem hasn’t been majority Jewish since the mid 19th cen., this is the kind of prejudice that prevents justice from prevailing there and around the world.